A growing number of supermarkets allow their customers to shop online for their groceries, preparing the order for pick-up or delivering it directly to their door. 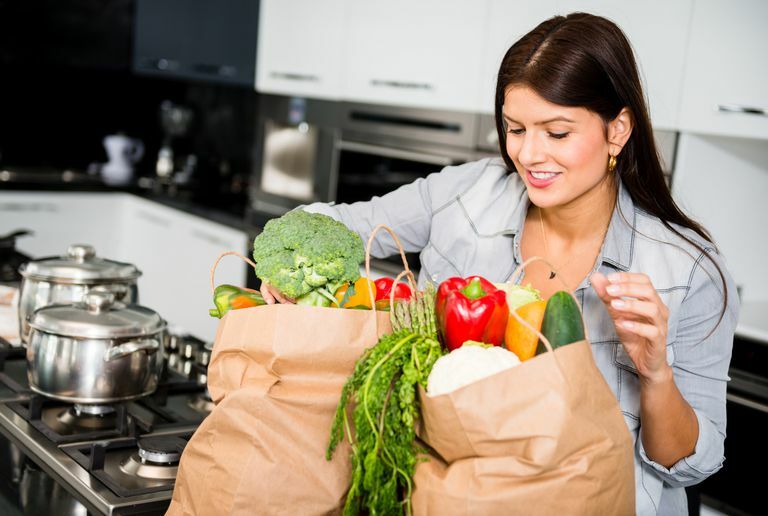 Shopping from home for your grocery store items is a great way to deal with this necessary chore: It's convenient, it's a time saver, and sometimes you can even take advantage of online sales not otherwise accessible. This service isn't just for packaged goods, either. Many stores offer shoppers the opportunity to order fresh produce, meats, dairy, and other groceries online and get these items delivered directly to their homes. In addition, many products that aren't necessarily found easily in stores can be found online — sometimes for a much cheaper price. You might even be able to ​take advantage of online rewards or cash-back offers, too. Only available in select locations. Amazon is the largest online retailer today. The company's grocery offerings span from beverages to meats to seasonal gifts and baskets. In the past few years, Amazon has greatly expanded its online grocery items, offering subscriptions to frequently purchased items (resulting in significant discounts for these subscription items) as a deep catalog of specialty items most bricks-and-mortar stores just can't carry. If you subscribe to regular delivery (every one, two, three, or four months), you can save a significant amount of money. Use a Dash button for re-ordering — it's free and streamlines the purchase of frequently used items. Amazon Prime customers enjoy free shipping on all grocery orders that qualify for this offer, as well as any discounts additional that might apply. Fee per order or subscription for unlimited delivery. FreshDirect delivers fresh, organic, gourmet food to many different areas within the United States. Just enter your zip code to find out if they deliver to your area. Their online grocery items come directly from local farms and dairies, with specialization for people with kosher, gluten-free, or organic and natural food preferences. Pickup options are often available. Orders are shipped by local vendors. Local Harvest aims to connect people in their local communities with fresh, organic, farm-to-table produce and goods. Customers can find produce online both in their local areas and other cities nationwide; not all of the farms represented in their directory offer delivery outside of their local areas, but many do. Shoppers can also take advantage of Community Supported Agriculture deliveries, subscribing to seasonal produce and visiting their selected farms once each season. Orders are shipped, not local. ShopFoodEx features nearly 10,000 grocery items. You can also make lists on the site, take advantage of seasonal specials, and shop a limited array of warehouse items. ShopFoodEx delivers to APO/FPO addresses. Also, when you spend $100 or more, the site will drop shipping charges by 33 percent. Minimum order limit for delivery. Many people welcome a Walmart store in their hometowns. These stores now offer online grocery ordering with free same-day pickup and delivery. Free shipping for orders over minimum limit. Only Go Bio! branded products available. Orders are shipped, not locally delivered. Stock organic and kosher foods with GoBio. The site offers high-quality food delivered to the United States and Canada, with free shipping on orders over $85. Watch for E-Specials, which change frequently. You can sign up for the email newsletter to track the specials more conveniently. Orders are not always accurate. Deliveries are not always reliable. Safeway extends the convenience of online grocery shopping to quite a few areas in the U.S.; you can see if your zip is covered here. Shipping fees are low, and there are a lot of grocery items from which to choose. When you fill your online cart, use the Request to Personal Shopper feature to issue directions for specific items, i.e., "please provide firm tomatoes." Delivery fees vary based on chosen retailer. Mobile app is difficult to use. MySupermarket is a UK-based service that provides online grocery shopping for many different stores including Tesco, Asda, Sainsbury's, and Ocado. Compare prices instantly across all the stores that MySupermarket currently indexes and find healthier options for anything you might have in your shopping cart.